While fitness is an important aspect of everyone’s lives, it is even more so as our bodies age! Studies have shown that staying physically active can help prevent, diminish or relay the onset of many diseases and disabilities that seniors are prone to. If you or a loved one are feeling held back from exercising, perhaps you’ve fallen prey to fitness myths like the one’s we shared below! Keep reading to see if any of them sound like the familiar excuses you’ve used and/or heard! This is not true! You can never be too young or too old to start bettering your health! While some believe that being aging can increase your chance of injury when exercising, the truth is that if you are exercising properly, your chances of injury are usually next to none! Simply know your limits and ask your physician for advice before doing anything too ambitious! Popular to contrary belief, most fractures in the elderly are due to falls that are not exercise related! With age, we begin to lose our balance and this is completely normal! In fact, this problem can be easily remedied with exercises that work to improve and complement our existing balance. For those looking to build up their core and improve their balance, we would recommend incorporating low impact exercises into daily routines! Try walking, cycling, swimming, water aerobics, or even low impact aerobic fitness classes for seniors! This myth is nothing more than an excuse! Believe it or not, exercising actually helps us to maintain healthy hearts and spare us from unwanted cardiovascular diseases! When we exercise in moderation, our risk of heart disease is decreased tremendously due to that fact that our blood flow and circulation are increased to healthier-than-usual levels! While we recommend incorporating exercises into your daily routine, we still believe that it is important to chat with your doctor about potential concerns and complications that could occur. Be sure to follow his/her recommendations as they likely know you and your body best! For many, just the the thought of exercise may seem challenging! What makes this worse is that as we age, our metabolism naturally slows down and our bodies begin putting on extra weight. While this can’t be prevented, we’re happy to say that it can be combatted! Exercising every day for the recommended 30 minutes can actually help increase one’s slowing metabolism. So don’t wait up! Start shedding those extra pounds today and speeding up your metabolism again! You’ll be reaping the benefits in no time! Slow and steady is the trick! Don’t jump into the game expecting yourself to lift 30 pounds right off the bat! Begin with body weight exercises using dumbbells that weigh as little as 2 pounds each and see where your body can take you from there! While the weight in numbers may seem small, simple exercises incorporating them can help you tone your muscles while strengthening your bones! Remember that endurance needs to be built so don’t rush it! 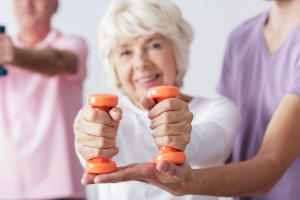 At Skilled Therapies, our mission is to help seniors effectively improve their quality of life! If you or a loved one have ever fallen prey to one or more of these myths, be sure to share it with us below! We can’t wait to hear about all the positive changes this eye-opening article will make in your life this month! If you require more information or assistance on topics like this, feel free to contact us at 925.271.9100 or drop by one of our 6 convenient locations today! Exercise is Important. But Without These 3 Things, It Can Be Damaging!